CrossFit Live was Dave Young’s version of CrossFit Radio from 2005 and 2006. This is the sixth episode from September 11th, 2005 with Tom Corrigan. Tom is a firefighter and kettlebell coach. 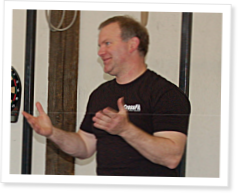 Tom talks about using kettlebells to train for firefighting and the RKC before taking questions from Dave and a variety of callers. RKC was the best weekend of my life. The Coaching was excellent! The fact that you have to walk the walk eliminates most of the trainers that are not in this for the right reasons. The RKC is a brotherhood. Surviving what they dish out makes me proud to be part of their community. Much like Crossfit there are some serious bad asses.